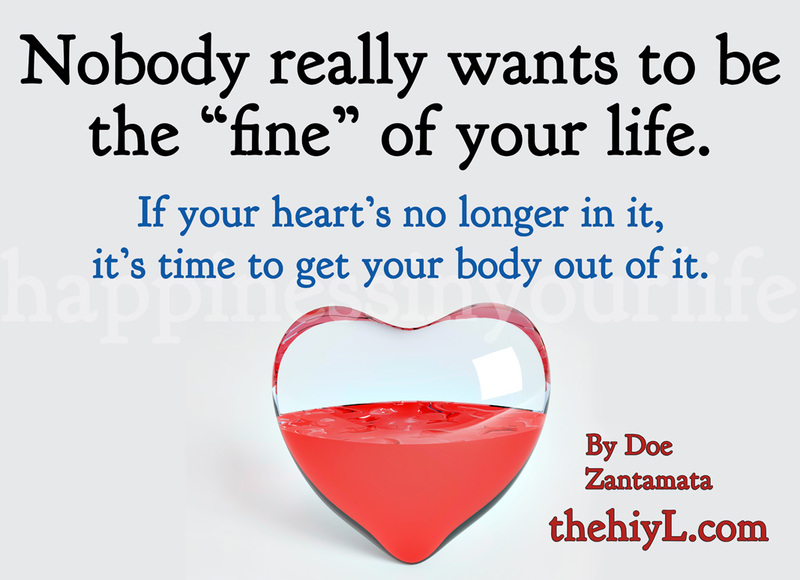 Nobody really wants to be the “fine” of your life. If your heart’s no longer in it, it’s time to get your body out of it. If you’re in a relationship and all you do is fight, even though you really tried to be your best, tried counseling, tried everything, eventually something inside dulls. The fight to make things better just disappears. When that happens, if you’re still in the relationship, that relationship becomes a permanent compromise. You may even go on vacations, spend time together with friends, but it’s not enjoying life together, but instead, it’s going through the motions together. Some people may tell you “that’s just how marriage is,” or “that’s just what happens after awhile,” but that doesn’t have to be true for you, even if they’ve resigned to that being true for them. It’s like sitting in the movie theater long after the movie stopped. You’re just…there. You may try to talk yourself into loving them, recognizing what a good person they are, knowing full well how much they love you. But you can’t think your way into feelings that you just don’t have. You can talk yourself into loving someone who’s nice to you just about as easily as you can talk yourself out of loving someone who’s bad to you. The heart has a mind of its own. It’s up to you to break it off, and give both of you a chance to find someone to love and be loved by in return. They love you with all their heart, but they want you to love them just as much. Just because you don’t, it doesn’t mean that no one will. You’re not doing them any favors by keeping them around. You’re preventing them from finding someone out there who will appreciate them more than you do. They won’t ever break it off because they love you and really hope that one day you will love them back, but you know when that’s just not going to happen. Set them free. They deserve that gift from you. That would be an honorable way to return the love and kindness they’ve shown you. Counseling is the key to this... if you've truly done all you could have done.. pride cant rule nor can you pretend you are trying if your every action is pushing away love or progress. Fear is the cancer at the base of every prideful reaction to the truth... dont protect your pride more than your marriage..
hmm the reason the philosopher didn't add the "wherever your heart isn't don't stay" is cause he must have known that millions would use it as an excuse for not actually putting your whole heart into something and they would somehow be justified to walk out on commitments they made to spouses and themselves to love someone other than your self... and they would just run from their fear of trusting or truly loving another... and the philosopher was meaning the very opposite of that. I guess the question you'd have to ask yourself then is, "why would you want to be with someone who doesn't really want to be with you, but does so only out of guilt or being made to feel obligated?" If they stay for those reasons and not because they want to, it will only lead to them resenting you later on down the line.